I'm just wrapping up three weeks of filming in Germany, and I'm impressed by the souvenirs of its tumultuous history. Doing TV shows on Frankfurt, Nürnberg, Dresden, Leipzig, and Hamburg, you can't avoid the flipside of Germany's greatness. Here are a few historical artifacts that have stuck with me. Outside of Leipzig is the wildest war memorial I've ever seen. This is the 300-foot-tall Völkerschlachtdenkmal. Just saying it makes you think "huge casualties." 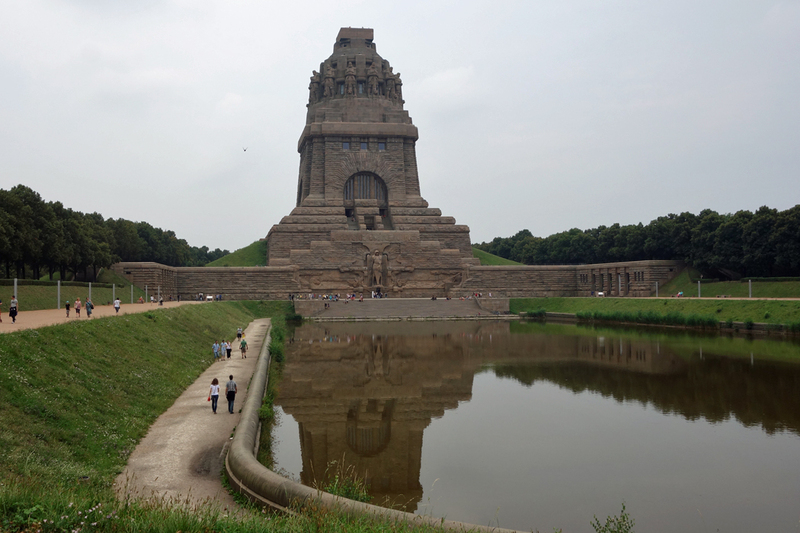 It is the Monument of the Battle of the Nations, built in 1913 to commemorate the biggest battle of its day: when Prussia, Austria, Russia, and other allies teamed up to beat Napoleon in 1813. Half a million men were involved, and there were about 100,000 causalities. The powerful art and symbolism inside makes you weep and salute at the same time. Do you have a personal "most impactful war memorial" in Europe? This statue, on Leipzig's main drag, recalls the dual dictatorships -- first from the far-right, then from the far-left -- that Germany lived under in the 20th century. It features the flat-palmed Sieg Heil! Nazi salute and the proletariat's raised communist fist at the same time. Meanwhile, the poor fellow who has little choice but to raise his arms scrunches down under his collar, hoping to somehow get through it all. After spending ten days filming our upcoming public television special on Martin Luther and the Reformation, we were tuned into statues of Martin Luther. 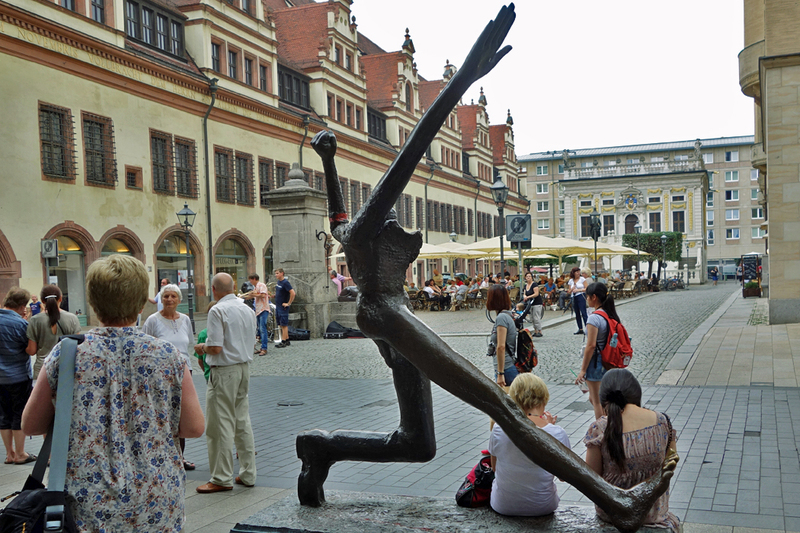 He seems to be on squares and in front of churches all over Germany. 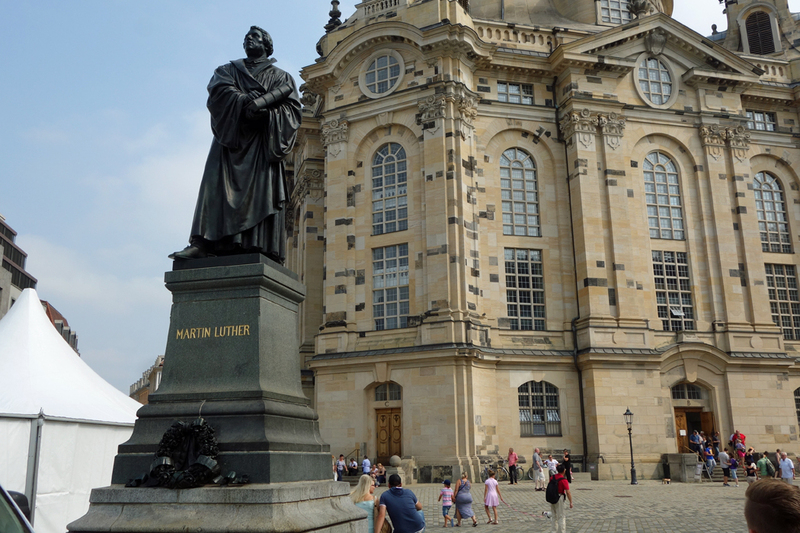 Here in Dresden, in front of the Frauenkirche, we met another Luther -- hand on his Bible, as if reminding people of his mission to translate the Word of God from Latin into the people's language, so all could read it for themselves. At the Nazi parade grounds in Nürnberg, we stood on the tribune platform where Hitler stoked the fears and hatreds of 200,000 assembled Nazis. And then our guide took us inside the structure, through several huge, stark, gold-veneered rooms with massive dishes for devilish flames. 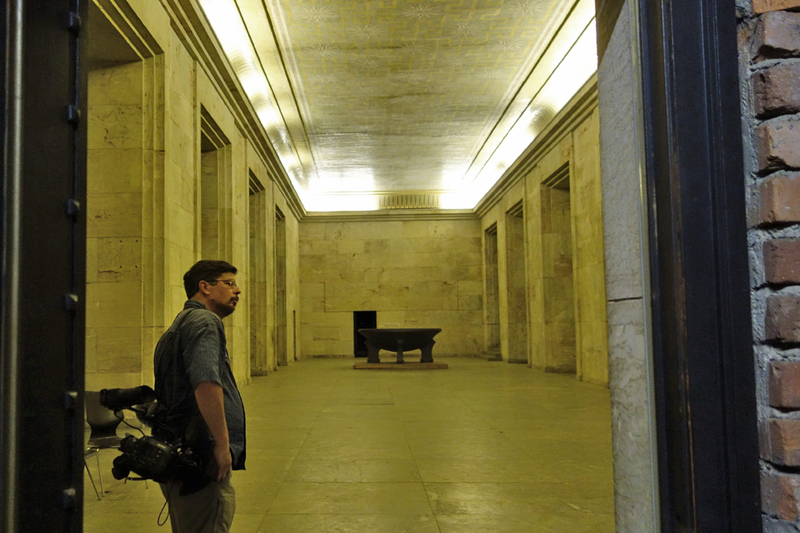 As these rooms aren't open to the public, we didn't film them (because we have an ethic of not showing things on TV that our viewers can't personally experience). But it was a chilling little side-trip.